But before animal rights advocates champion this law, we must step back and look at what is actually happening. This is being called “Schultz’s Law,” so named for a German Shepard police dog, Schultz, who was killed while pursuing a suspect. According to police allegations, when Schultz grabbed the arm of the suspect to apprehend him, the suspect purposefully flung Schultz into oncoming traffic. Schultz died from injuries sustained when a car hit him. As tragic as Schultz’s death is, the reaction is worse. This law is a child of the uproar from the officers who cared for Schultz, and from an upset community in Washington Township that had grown accustomed to Schultz’s presence at community events. His death occurred in late November, 2010. Put that into perspective; animal advocates have been fighting for years to increase, or even create, penalties for animal abusers, and this bill moved into law in less than a year. What that tells us is that it is a reactionary law, a stringent one at that, and those kinds of actions have traditionally caused future unforeseen problems. Even if this is the appropriate penalty for killing an animal, it should be enacted because it has always been wrong, not solely because of a high profile death. More importantly, this is not a law about animal rights; this is a law to protect police. That isn’t to say there should not be laws protecting officers. If this, however, were really about protecting animals, there would be no reason not to extend the same consequences to the purposeful killing of any dog. Yet again, all animals are equal, but some are more equal than others. A German Shepard, picked for no other reason than he is particularly obedient, means more to New Jersey than a mutt, or a less well-behaved German Shepard. It will be interesting to see how often and to what extent Schultz’s law will be enforced, and to see how it is argued by both defense and prosecuting attorneys. Until then, what we should take away is that it is possible to push strong animal protection bills through the legislature, so long as there is sufficient and outspoken public support. Hopefully overdue overarching laws will find their ways into the books for the right reasons. A very insightful article on this new law in NJ and it’s emotional expedite through the legislature. I agree, I am waiting to see if this law falls short of it’s intended purpose due to it’s singular nature. Everyone who owns a dog would like to apply it to a purposeful killing of their animal. Just because a dog is well trained is he/she more valuable? The owners I have worked with mediation and collaborative practice of animal conflict issues would not feel this way. As always food for thought. Let’s not throw out the baby with the bath water and feel we have made huge strides with Schultz’s Law. 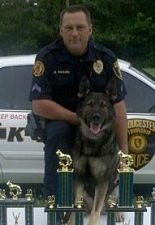 NJ now recognizes the intentional killing of a police dog as a felony. Hopefully, the leap to viewing every animal who is intentionally killed, in this way, will be less of a leap. David is completely correct when he says passionate emotions drove this bus through the legislature so quickly. hazaaah! great works & piece. thank you! This “law” does nothing but reinforce the principles behind classism and speciesism. Since these K9 dogs have some human-extended, “extra value” they are given such protections. So sad for the “unspecial” “mutt” who may be killed for any number of a thousand bad reasons. Thanks for bringing up this contradiction. I don’t think it’s a step forward at all. I agree with the blog and the comments, especially Bea’s contention that this law “reinforces the principles behind classism and speciesism.” That makes it an essentially unfair law, doesn’t it? Because it’s not just to all equally, it is not true justice. By the way, I see no evidence that the blog was written by David. “Anonymous” is its author. Perhaps we’d best not assume anything and honor the author’s wish to remain, in fact, anonymous. I know no one meant any harm, but this is a sensitive situation. The New Jersey law requiring mandatory prison time for killng a police dog is good legislation — and a step in the right direction on behalf of all animals. Whenever we can increase the penalties for abuse of any animal, we have a move in the right direction. If only we could see this concern applied to farm animals, who constitute over 95% of animals suffering at the hand of mankind. Thank you, Judy Bash, Ph.D. Most people acknowledge the moral obligation to be kind to all dogs and to attend their needs. It is simply and self-evidently the right thing to do. Still, if humans assign a greater societal value to one dog or type of dog than to others, that’s our prerogative. Dogs are our charges and dependents; we are their masters and owners. There is no equity or equality in the relationship. And dogs couldn’t care less. A dog under the charge of humane masters is one of the most fortunate beasts alive. He is indeed more fortunate than many people. But even all that aside, laws assigning stiffer penalties for attacking and/or killing a police officer, his dog, or vandalizing police property really have nothing to do with the value assigned to the individual — either in moral terms, or in terms of the law. Even if, for the sheer sake of argument, we humor the assignment of some sort of anthropomorphic value to a dog’s life, we’re still essentially missing the point of why there are stiffer penalties for attacking police officers, dogs or property. Rather, an assault on the police — or any manifestation thereof — is viewed by society as an assault, at least by extension, against the very concepts of law and order. In other words, if you break a squad car’s windshield, kick a police dog or take a shot at an officer, you are, in essence, assaulting the very concept of law itself. And, by extension you are assaulting one of the keystones of society — because this is a society resting upon the rule of law. So, again, it’s not so much about the individual car, dog or person, it’s about what they represent — and what your actions represent should you decide to assault, harm, damage or kill them. That is why violations against police carry stiffer penalties than other crimes.